Unlike other global environmental problems, like climate change for instance, biodiversity loss is not as widely recognized by the general public as an issue and is thus also largely unrecognized by industries that rely on the general public as a consumer pool. According to The Guardian, a British news provider, "climate change regularly makes the front page, but very few people know about, or understand, the cost of species loss." (Vaughan 2010) One of the reasons that the climate change movement has gained such incredible awareness is because organizations like NASA, National Science Foundation, National Oceanic and Atmospheric Administration, Alliance for Climate Education have joined in the effort to educate the public and set aside funds to do so. In an effort to greatly enhance popular support for the biodiversity crisis, the Convention on Biological Diversity (CBD), the United Nations Educational Scientific and Cultural Organization (UNESCO), and other organizations are beginning to incorporate biodiversity into their educational efforts. According to UNESCO's Biodiversity Initiative website, "education brings sustainability to development efforts; it is the way to shape new ways of seeing the world, new practices and behaviors and makes biodiversity conservation possible" (Biodiversity and education, 2011). In 2011, on average 65 per cent of consumers in France, Germany, the U.K. and the U.S. said that they had heard of biodiversity, a 60 percent increase from the previous year (Towards sourcing and respect, 2011). Additionally, of those surveyed, three quarters indicated that they were interested in how companies sourced natural products, and two thirds stated that the environmental and ethical practices of a company would affect their purchasing habits (Towards sourcing and respect, 2011). As consumer awareness of biodiversity continues to rise, biotrade, or the sustainable development and trade of products derived from native biodiversity, is developing to satisfy the new demand for ethically and environmentally-minded sourced goods. Biotrade was first introduced by the United Nations Convention on Trade and Development (UNCTAD) in 1996 (Business.2010 Newsletter, Vol.5 Issue 2, 2010). Education outreach efforts must consider the economic and social standing of the countries in which programs are to be implemented and question the feasibility of certain educational goals depending on these parameters. In an effort to deal with the economic inequalities between different countries, our global education plan will delineate between more economically developed countries (MEDCs) and less economically developed countries (LEDCs). 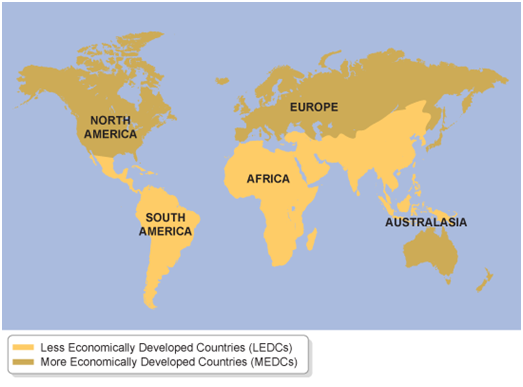 See Figure 1 for the global distribution of MEDCs and LEDCs.